Fabricated from stainless steel curved elements, 4m high, it contains a cast glass sphere bearing palm prints. The whole structure is supported on an angled sawn Portland stone block, 70mm X 70mm section. This block features a letter cut inscription detailing the chemical equation for the production of chlorine by the electrolysis of brine, on two sides. 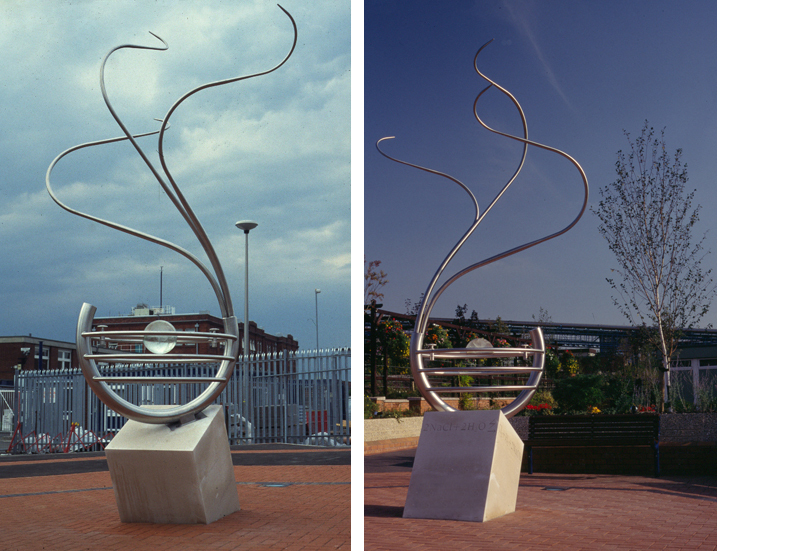 The stainless steel element was fabricated by Payne Engineering Company, working closely with Phil in accordance with his drawing and scale maquette of the sculpture. Diane made the sphere element, which was cast by Colin Reid Glass, The Portland stone base, was sawn and transported from Bath and Portland Stone Limited, Dorset.